High-yield stocks built to last for years to come are hard to find, but we have three picks for your portfolio. Owning long-lasting dividends can be a great way to both generate cash and beat the market. What I think is amazing is that companies who can spit off growing levels of cash will literally give you a raise every year without doing a bit of work. We asked three of our investors for their favorite high-yield stocks with long-term potential, and Intel Corporation (NASDAQ:INTC), Caretrust REIT Inc (NASDAQ:CTRE), and Verizon Communications Inc. (NYSE:VZ) were the top picks. Here's a look at why their dividends are built to last. Leo Sun (Intel): Intel fell out of favor with investors this year thanks to growth concerns regarding its PC and data center chip businesses. Its PC chip business faces sluggish PC sales and tough competition from a resurgent AMD (NASDAQ:AMD), while its data center business is being dented by sluggish enterprise spending and longer upgrade cycles. But Intel's growth numbers aren't that bad. Its Client Computing (PC and mobile chipsets) revenue rose 12% annually last quarter, and its Data Center revenue grew 9%. Its total revenues grew 14% annually, and its earnings jumped 22%. Wall Street expects Intel's revenue and earnings to respectively rise 3% and 11% this year. Intel certainly needs to counter its numerous challengers with its next-gen 10nm x86 chips, but it's been the "best in breed" chipmaker for decades -- so it's unlikely to be toppled anytime soon. Intel is also inorganically expanding into adjacent markets -- including Internet of Things devices and the driverless car market -- by buying collision avoidance system maker Mobileye (NASDAQOTH:MBBYF) and other smaller companies. It expects its purchase of Mobileye to be immediately accretive to its non-GAAP earnings and free cash flow when it closes -- which will support its ability to pay reliable dividends. Intel currently pays a forward yield of 3.1%, which is supported by a payout ratio of 40%. It's hiked that payout annually for three straight years. The stock trades at just 13 times earnings, compared to the industry average of 24 for semiconductor makers. That high yield and low valuation should limit Intel's downside as it evolves its chipmaking business toward higher-growth next-gen markets for the 21st century. Jason Hall (Caretrust REIT Inc): One of the biggest trends that will have a big impact on the first half of the 21st century is the aging of America's Baby Boomer generation. Over the next 13 years, an average of 3 million boomers will turn 65, a trend that will more than double the size of that group in less than 25 years. Caretrust REIT is one company that's very likely to do well as this trend plays out, helping fill the need for more senior housing, healthcare, and rehab facilities to support this quickly expanding group of aging Americans. So far this year, the company has acquired 20 new properties, and it now owns 174 properties in 23 states. And as a relatively small player -- its biggest peers own three times as many or more properties -- Caretrust is very well-positioned for many more years of double-digit growth. And as a real estate investment trust -- or REIT -- dividend investors should do incredibly well. Caretrust shares yield around 3.8% at recent prices, and the company has a strong track record of increasing its payout. And with the demographic trend outlined above set to grow the need for the kinds of facilities Caretrust specializes in, there are very good odds that ultra long-term investors who buy shares now and hold for decades to come will do very, very well. Travis Hoium (Verizon): Telecommunications has long been one of the biggest and most consistent money-making businesses in the U.S. Verizon is one of the biggest, and most profitable, telecommunications in the country, and it shows no signs of slowing down. As one of the top two cellular companies in the U.S. (along with AT&T (NYSE:T) ), Verizon has built an infrastructure lead that smaller competitors simply can't compete with. You can see below that Verizon has more than four times the capital equipment on the ground as Sprint and T-Mobile. 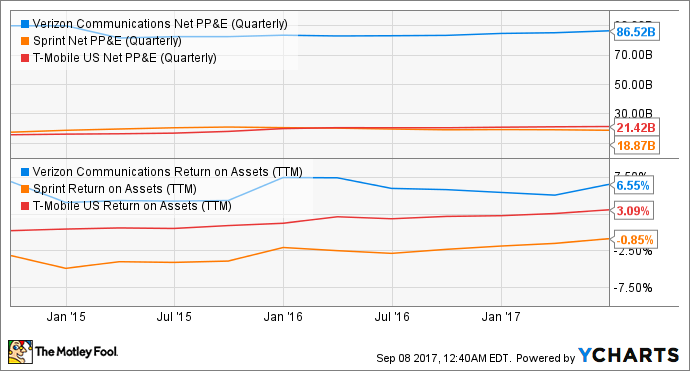 VZ Net PP&E (Quarterly) data by YCharts. Not only does Verizon have more assets on the ground, it generates a higher return on the assets it has. The scale is a huge advantage in telecommunications, and Verizon has scale only AT&T can compete with in any real way. The scale and profitability of Verizon are key now that 5G cellular networks are being built. The company will have the ability to roll out a national network quicker than smaller rivals, building an entrenched lead in 5G that it may never give up. For investors buying today, you get all of this competitive advantage along with a stock trading at just 12 times trailing earnings and sporting a 4.9% dividend yield. That's the kind of high-yield company I want to own for this century.